BMX racing is a type of off-road bicycle racing. The format of BMX was derived from motocross racing. BMX bicycle races are sprint races on purpose-built off-road single-lap race tracks. The track usually consists of a starting gate for up to eight racers, a groomed, serpentine, dirt race course made of various jumps and rollers and a finish line. The course is usually flat, about 15 feet (4.6 m) wide and has large banked corners that help the riders maintain speed. The sport of BMX racing is facilitated by a number of regional and international sanctioning bodies. They provide rules for sanctioning the conduct of the flying, specify age group and skill-level classifications among the racers, and maintain some kind of points-accumulation system over the racing season. There is a list of plates that are able to obtain the list is Gold Cup state Race of Champions roc N. A. G sport is very family oriented and largely participant-driven, with riders ranging in age from 2 to 70, and over. Professional ranks exist for both men and women, where the age ranges from 18 to 40 years old. There are two BMX racing bikes sizes. One is the 20" wheel bike. This bike is common with minors and is currently the most common class. The Cruiser bikes are any bikes with a 24" wheel. However, any bikes that have a wheel larger than 24" will still be considered Cruisers. Cruisers are more common with older racers and is rapidly growing. The cruiser style bike tends to be easier to jump and rolls better while the 20" is seemingly more agile. There are all types of BMX jumps, ranging from small rollers to massive step-up doubles. There are pro straights which are for junior and elite men. They are all doubles which range from about 6 m to 12 m, while "Class" straights have more flow and have many more range of jumps. The Starting hill marks the start of the track. Most BMX Tracks have a gate. The starting hill will normally provide all the speed for the remainder of the race. Generally, the larger the hill, the faster, so pro hills are much larger than the amateur ones. Turns are at an angle. Therefore, you can easily turn without having to brake. The double are two hills close to each other. A hill, then followed by a shorter hill. A small hill, normally in groups. A flat jump, normally for learning to jump. A set of jumps with only a takeoff lip and a landing, usually spaced 7 to 15 apart. BMX racing became a medal sport at the 2008 Summer Olympics in Beijing under the UCI sanctioning body. Sanctioning body of the United States of America is USA BMX. USA BMX is certified under the UCI (International Cycling Union), which is recognized by the Olympic Committee. A sanctioning body is a private (in the United States and most Western Nations) governing body which controls a sport or specific discipline thereof. One or more sanctioning bodies may operate in a sport at any given time, often with subtle rule variations which appeal to regional tastes. They make and enforce the rules, and decide the qualifications and responsibilities of the participants, including the players, owners, and operators of facilities. In legal terms, they are an intermediary between the participants and higher governing bodies such as (in cycling) the Union Cycliste Internationale (UCI) and National Governing Bodies such as USA Cycling. Sanctioning bodies mete out discipline and punishments, as well as bestow awards and rankings of their participants. In the Bicycle Motocross context, sanctioning bodies are chiefly responsible for providing insurance coverage and other "back office" services to local tracks. They also keep points on riders' performance throughout the year, and undertake the production of a national racing series (which is typically 18-22 weekends per year). Riders are permitted to race at the sanctioning body's affiliated tracks and national events via the purchase of an annual membership which costs (in the US) US$60. As part of their administrative "service provider" role, BMX sanctioning bodies also determine the rules of competition, such as clothing requirements, age and gender divisions (or "classes"), as well as the rules and protocol for advancement in proficiency classes (Novice, Intermediate, Expert, A Pro, AA Pro, Women, and Vet Pro in ABA, In NBL Rookie, Novice, Expert, Super-Ex, Elite, Masters are the proficiencys). BMX Racing has had many sanctioning bodies over its 40-year history as an organized sport, the first being Scot Breithaupt's Bicycle United Motocross Society (BUMS), created in the early 1970s (see below). Since then, there have been dozens of regional, national, and international sanctioning bodies, some of them associated with or owned by another. Most are defunct or have been merged into larger, more successful organizations, but a handful still exist in their original forms and are prospering. In the US, loyalty to one sanctioning body or another is a fundamental example of brand loyalty, where devotees of one vigorously assert the superiority of their chosen body overall others. The first one was formed in May 1975 by Bob Smith, an Australian businessman and two of his friends. He open the first BMX track in Australia on May 17, 1975 on the Gold Coast in Tallebudgera, Queensland adjacent to the Tally Valley Golf Club. He had admired BMX through the American magazines his son brought home. The second ABMXA was formed in April 1981 from three regional Australian BMX organizations: The Victoria BMX Association; (VBMXA), the Queensland BMX Association (QBMXA) and the New South Wales BMX Association (NSWBMXA). It was Australia's representative to the IBMXF in the 1980s. The National Bicycle Association was a third, separate Australian sanctioning body. It was formed in December 1981 and had branches in different countries around the world. By the summer of 1982 it had 20,000 members worldwide and 950 members in the Australian states of Victoria and New South Wales. Despite sharing a common name this association had nothing to do with the original United States–based National Bicycle Association that was formed in California in 1974 and ironically merged with the National Bicycle League and ceased operations as an independent body in December 1981, the same month and year the Australian namesake was formed. BMX Australia (BMXA) is the current sanctioning body for BMX in Australia. All Ontario tracks and some BC tracks are sanctioned by an American corporation - USA BMX (also known as ABA) under the assumed name BMX Canada - http://www.bmxcanada.org These tracks run rules separate from the UCI but offer similar race structure and age categorization. BMX Canada offers full support to their affiliated tracks, including point tracking, marketing materials, an in-house magazine and a coaching/retention program. Results from these races run under the USA BMX/BMX Canada name are used in the team selection process for Provincial and National teams. La Fédération Française de Bicrossing, which in English translates to The French Federation of Bicrossing (FFB) was created on March 1, 1978 by Marcelle Seurat, a motorcycle importer and distributor. At first its primary purpose was to promote BMX and its products On May 17, 1980 it held is first race in Beaune, France. This organization would cease to exist in early 1981 after only acquiring 100 members. L'Association Française de Bicrossing, which in English translates to the French Association of Bicrossing (FAB), was founded by Raymond Imbert, Rene Nicolas, Denis Mourier, Bernard Nicolas, Fabrice Pérez, Gerard Hinault and Pascal Giboulot on March 1, 1981. On January 1, 1990, the AFdB joined the FFC. On March 4, 1993, BMX was recognized as an important sport by the French Ministry for sports. Today the official French BMX Sanctioning body is now the Fédération Française de Cyclisme (FFC), or in English the French Cycling Federation (FCF). It has almost 10,000 members. The Associazione Italiana BMX, which in English translates to Italian BMX Association, was founded in December 1981 by Aldo Gandolfo, an Italian journalist and sport promoter. In 1983 the A.I.BMX joined the I.BMX.F. and held the first official Italian BMX race. In 1984, the A.I.BMX held the first Italian international race in Pinerolo and organized the first Italian participation in European Championships. In 1985 Galdolfo left the Association, which was refounded with a new statute and a new board of directors. In 1988 the A.I.BMX concluded an agreement with the UISP in order to unify their respective national championships and in 1989 ceased the activity. The Unione Italiana Sport per Tutti, which in English translates to Italian Sport For All Association, is an amateur sport association which conducted an official BMX racing activity from 1985 to 1990, mainly developed in Piedmont and Emilia-Romagna. In 1988 concluded an agreement with the A.I.BMX in order to unify their respective national championships and in 1991 ceased the BMX activity. The Federazione Ciclistica Italiana (FCI), which in English translates to Italian Cycling Federation, is the national governing body of cycle racing in Italy and started conducting official BMX activity in 1984. It was a big promoter of BMX racing within the Fédération Internationale Amateur de Cyclisme (FIAC) and in 1985 held the first FIAC World Championship in Jesolo (near Venice). Every year the FCI organize the National Championship (held in a single race normally on the first Sunday of July) and a season-long competition called Circuito Italiano BMX (seven rounds in 2008, with the same point system as the UEC European Championship) open to Italian and foreign riders. The first sanctioning body in the Netherlands was called the Stichting Fietscross Nederland (SFN) (in English the Dutch Bicycle Motocross Foundation (DBMXF)) and was co-founded on October 19, 1978 by Gerrit Does and Louis Vrijdag. It held its first race on April 21, 1979. In December 1980 it was folded into the KNWU (see below) but a second incarnation was created in 1987 called the Stichting Fietscross Promotie Nederland (the Dutch BMX Promotion Foundation) to promote Dutch racing in the Netherlands. This second "SFN" was dessoved in 1997. On December 16, 1980 the SFN was integrated into the Koninklijke Nederlandsche Wielren Unie (KNWU) (in English the Royal Dutch Cycling Federation (RDCF)), the Dutch cycling sanctioning body that was the governing body for all types of cycling and represents the Netherlands as a member of the UCI. Some of the then-existing local tracks in 1980 did not become a member of the KNWU. Operating for a while independently, they formed another sanctioning body in 1987, the Nederlandse Fietscross Federatie (NFF), (in English the Dutch Bicycle Motocross Federation (DBMXF)). Both organizations function as sanctioning bodies for BMX racing. BMX New Zealand Incorporated (BMXNZ) is the recognised National Sporting Organisation (NSO) for BMX racing in New Zealand. It is a founding Member Organisation of Cycling New Zealand (CNZ) the National Federation for cycling in New Zealand. BMXNZ has a membership of 32 clubs (as of January 2017) based in seven regions. The UKBMXA was created in April 1980 by David Duffield as first as a way of promoting BMX in England. On August 30, 1980 it held its first BMX race in Redditch, England. This sanctioning body would later become affiliated with the IBMXF and represent England in the IBMXF sanctioned events including the European and World Championships. In the summer of 1985 it merged with the National Bicycle Motocross Association (NBMXA) with the UKBMXA being the dominant partner with its name carrying on. In November 1989 UKBMX Association (UKBMXA) and the British BMX Association (BBMXA) merged and formed the English Bicycle Association (EBA). This combination would represent England in the IBMXF. The EBA merged with the British Cycling Federation (BCF) which had represented all other aspects and disciplines of English bicycle racing other than BMX. This organization is now known as British Cycling. British Cycling now represents all aspects of sport cycling in the United Kingdom including BMX within the UCI. *Not to be confused with the now-defunct United States–based National Bicycle Motocross Association (NBmxA) (1972–1981) that was formerly known as the National Bicycle Association (NBA) and was the first BMX sanctioning body in the world. The British NBMXA ceased operations in the summer of 1985. On July 10, 1969, a group of boys riding their Schwinn Sting-Ray bicycles in Palms Park in West Los Angeles wanted to race. A park attendant, Ronald Mackler, a teenager with motorcycle motocross (MX) experience, helped them organize. Palms Park became to BMX as Elysian Fields is to American baseball, for at that moment Bicycle Motocross racing was born. By 1973, entrance fees of US$4.50 (which included a US$1.00 insurance fee for the year) for a 10-week season of Thursday-night racing was charged, and the top three racers in the season were given trophies. Then a new season of 10 weeks would start the following Thursday. The track operated well into the 1980s largely unchanged;, including the lack of a modern starting gate. The first BMX proto sanctioning body was the Bicycle United Motocross Society (BUMS) founded by Scot Breithaupt in Long Beach, California on November 14, 1970, when he was fourteen years old. On that day he put on his first ad hoc BMX race. At first BUMS simply referred to the transients that congregated in the field around 7th and Bellflower Streets where the track was located, but later Scot turned it into the acronym BUMS. The first race had 35 participants, who paid Scot a quarter (US25 cents) each for the privilege. At the next race 150 kids showed up. Since he was a motorcycle racer he knew even at thirteen the importance of a sanctioning body and how races were run and organized. He used his personal trophies that he won racing motocross motorcycles as awards for the winning competitors. He gave out membership cards, wrote the rulebook and had a points system for scoring and proficiency level promotion. He ran the first state championship in 1972, when he was all of 16 years old. Also due to his racing experience, he knew how to lay out a particularly exciting course. The track was about 1,350 feet (410 m) long and much more demanding than today's typical BMX course. It was more akin to what the professionals race on in special Pro sections of track at large events today, including water holes and high dropoffs. Indeed, this early track resembled more closely a shortened mountain biking course than today's comparatively well groomed BMX tracks. With the aforementioned exception of pro sections, today's tracks for the most part are pretty tame by comparison due to insurance concerns by the sanctioning bodies. The National Bicycle League even went so far as to ban double jumps in 1988. This first structured sanctioning body would eventually grow to seven tracks in California. This is what made him different from other track operators at the time: he did not just start one track but several others under a single jurisdiction of rules and regulations, all the requirements of a sanctioning body. Among the firsts credited to BUMS was the first professional race in 1975 at Saddleback Park with a US$200 purse. Breithaupt also promoted in a joint venture with the new National Bicycle Association (NBA) (which was established the year before) what would later be called "Nationals" with the Yamaha Bicycle Gold Cup series in 1974. They were three separate qualifying races held at three separate tracks in California sponsored and heavily promoted by Yamaha Motor Company Ltd. to decide the first "National" No. 1 racer at a fourth and final race at the Los Angeles Coliseum. It was an achievement of import in the infancy of BMX, but it was not a true national since virtually all the events were held in California and almost all racers were Californians. It would be left for other innovators to create a true national event. Many followed Ronald Mackler, Rich Lee and Scot Breithaupt, opening impromptu often short-lived tracks sometimes within preexisting Motorcycle Motocross tracks; but with the exception of Breithaupt, the operators were independent "organizations" that operated individual tracks without any cohesion. What was needed was a governing body that would standardize and give direction and purpose to the grab bag of these amateur-run (in that these operators did not have this enterprise as the main concern of their lives) tracks. The first official BMX sanctioning body was the National Bicycle Association (NBA) started by Ernie Alexander in 1972. Like Scot Breithaupt, he had motorcycle motocross in his background, and like Scot he was a promoter but a professional one with his American Cycle Enterprises (ACE). He was also a former Hollywood stunt man who promoted races at the famous Indian Dunes, built and managed by Walt James, where many movies and TV shows were filmed. In 1970 he noticed a group of kids trying to organize a bicycle race with their Schwinn Sting-Rays. Being familiar with motorcycle racing, he lent the kids a hand. He later opened the Yarnell track, a steep downhill course every bit as treacherous by today's standards as Scot Breithaupt's BUMS track—if not more so. In 1972 he created the National Bicycle Association, modeled on the existing American Motorcycle Association (AMA). It was Mr. Alexander who built a truly nation-spanning professional sanctioning body for BMX. Mismanagement irreparably damaged its reputation, including such practices as not reporting points totals in time, running races late and behind schedule, deliberately scheduling its own events opposite the events of other sanctioning bodies to weaken their attendance, and a less-than-attentive attitude to members. In its last two years it went through a name change to National BMX Association (NBmxA) in 1979. It tried to reorganize in 1981, starting new tracks and by most accounts had a spark of new energy and enthusiasm, but still suffered lack of ridership (racers were committed to other point races with the other sanctioning bodies). This was to no avail. The NBA, suffering financial difficulties, ceased sanctioning its own races and started joint operations and did merge its membership (but did not merge its management) with the NBL after the 1981 season. Mr. Alexander did try at least one more foray into the sport he helped to pioneer: he started the World Wide Bicycle Motocross Association (WWBMXA) in Chatsworth, California in 1981. Unfortunately it did not last more than two racing seasons. The National Bicycle League (NBL), a nonprofit organization, was started in 1974 by George Edward Esser (September 17, 1925 – August 31, 2006). It was originally based in Pompano Beach, Florida, in the US, but ultimately moved its headquarters is located in Hilliard, Ohio. George Esser was exposed to BMX by his son Greg Esser, who was famous within the sport and one of the sport's earliest superstars and first professionals. Like Ernie Alexander and Scot Breithaupt before him, he was a promoter who created the NBL as the BMX auxiliary to the National Motorcycle League (NML), now-defunct, when he became dissatisfied with how the races were run. The NBL started in Florida, and while it expanded rapidly on the East Coast of the United States and for most of its early history, it had only a few tracks west of the Mississippi River. That changed in 1982 when it inherited the membership and tracks of the defunct National Bicycle Association (NBA) which had ceased sanctioning its own races and then went into partnership with the NBL. The NBL acquired all the NBA tracks in the nation including all those west of the Mississippi. As a result, it became a nation-spanning sanctioning body like the ABA. In 1997 the NBL joined USA Cycling, a sanctioning body that has long supported road race, mountain biking and other cycling disciplines in the United States, tracing its roots back to 1920. The resulting organization is the National Federated body that represents cycling in the United States. USA Cycling is part of the Union Cycliste Internationale (UCI) also known as UCI Cycling, the Switzerland-based international governing body that oversees virtually all aspects of cycling around the world (see International Sanctioning bodies below). The NBL had a previous association with the UCI through its affiliations with the defunct NBL sister organization, the International Bicycle Motocross Federation (IBMXF), which was also co-founded by Mr. Esser. The UCI absorbed IBMXF in 1993 through its amateur cycling division, Fédération Internationale Amateur de Cyclisme (FIAC), which in the prior five years held joint World Championships for BMX with the IBMXF (See International Sanctioning bodies below). On May 17, 2011 The NBL announced that a letter of agreement was signed and approved by their Board of Directors, to merge operations with the ABA. The merged organization would be controlled by ABA ownership, and would be called USABMX. After a month of wrangling, and negotiation between the parties, the final documents were signed on June 18, 2011. That day was the first time in more than 35 years that the sport of BMX Racing was run under a single sanctioning body in North America. The following week, the NBL Midwest National in Warsaw, Indiana was the first event to be run under the USABMX banner (though was still an NBL-branded event, as part of their 2011 national series). The 2011 NBL Grand National was the final NBL race of all-time, held September 3–4, 2011 and dubbed "The Grand Finale." The American Bicycle Association (ABA), created by Gene Roden and Merl Mennenga in 1977, originated in Chandler, Arizona, USA. Mennenga thought at the time that the kids and their families were being cheated by unscrupulous promoters (not the aforementioned individuals). As the NBA was declining, the ABA inherited many of its tracks and members making the ABA within two years the largest, albeit youngest, and the first truly nation-spanning sanctioning body. It was the ABA which introduced the "Direct Transfer System" that shortened the duration of race events. The ABA also started the team trophy concept to award trophies and prizes to the bicycle shop and factory teams with the best race results over a season. It was also the first to install electronic gates for its starting line with "Christmas tree" style lights (reminiscent of drag racing), to ensure fairer starts. It also started the BMX Hall of Fame, now called the National BMX Hall of Fame, recognizing the pioneers and industry visionaries of the sport. Today it is the largest sanctioning body in the world (a position it won as early as 1979 when it surpassed the NBL and the old NBA in numbers) with an estimated 60,000 members and 272 affiliated tracks in the United States, Mexico, and Canada. It is technically an international organization, but does not bill itself as one, based on its mandate to grow BMX in the United States, unlike its predecessor, the International Bicycle Motocross Association (IBMX), and its chief early rival, the NBA, both of which had international aspirations. The ABA brand was retired at the close of the 2011 season, becoming USABMX as part of its merger with the rival National Bicycle League (NBL). Along with the majors and pioneers, there were other BMX governing bodies, both national and regional and past and present. Among them were the Bicycle Motocross League (BMXL); the United Bicycle Racers Association (UBR) (1977–1983); the United States Bicycle Motocross Association (USBA) (1984–1986), which merged with the ABA at the end of the 1986 racing season after financial trouble made it unsustainable; the International Cycling Association (ICA), which was started in part by professional racer Greg Hill in 1990; and the Southeast Region-based National Pedal Sport Association (NPSA) (1975–1988). They are all gone now, but they did affect, for good or ill, the American BMX scene. The International Bicycle Motocross Federation (IBMXF) was founded on April 3, 1981 by Gerrit Does, a former motocross racer and Dutch citizen. He introduced BMX to the Netherlands in 1974 after seeing it in the United States. He also started the first European BMX sanctioning body the Stichting Fietscross Nederland (SFN) (the Dutch Bicycle Motocross Foundation (DBMXF) in English) in the Netherlands in 1978. George Esser, the same man who founded the American-based National Bicycle League (NBL) in 1974 was the co-founder of the IBMXF, after Mr. Does approached the NBL to begin preparations for the new body in December 1980 with the representatives of sanctioning bodies from Canada, Colombia, Japan, Panama, and Venezuela as well as representing his native the Netherlands. The IBMXF was a Waalre, the Netherlands-based body that conducted international events including its own World Championship event until its formal merger with the Union Cycliste Internationale (UCI) amateur cycling division the Fédération Internationale Amateur de Cyclisme (FIAC) in 1996 to form the largest international sanctioning body. The UCI championships have since superseded the old IBMXF championships and unlike the old FIAC BMX championships it has a pro class. The NBL was affiliated with the UCI through its previous ties with the IBMXF and its merger with the FIAC. In the old days of the IBMXF when you raced an IBMXF sanctioned race you received NBL state points and points that went toward your international standing, but no national NBL points that counted toward contention for national number one plates. The World Championship title was open to 16 & over Experts and older amateurs in the 20" class as well as Pros in the 20" class. There is a class in European BMX called Superclass. In this class, which is ahead of Expert and the last step before going pro, amateurs race for and win money, an odd contradiction of the generally accepted definition of amateur. However, no racer in Superclass could win more than US$200 per event and keep their amateur standing. This class has been carried over in the UCI after the merger with the IBMXF. In the United States IBMXF affiliate the NBL, Superclass is the equivalent of the old "B" pro class and "A" pro is now called the Elite as per UCI practice. However, for the first few years the IBMXF while there was a pro class, the professionals did not race for money but trophies just like the amateurs and the prestige of being declared World Champions with its associate side benefits in marketing. It was not until 1987 did the pro race for award purses at the IBMXF World Championships. Among the European standards of racing the IBMXF observed is the rule that racers must stay within their lanes until 25 feet (7.6 m) out of the gate. This is to prevent racers from throwing elbows at each other and to eliminate major crashes before they even get to the first jump. However, on tracks with short straights those who must start from the outside lanes are at a serious disadvantage since they cannot begin moving inside to shorten the distance before the first turn. As a result, many races could be won or lose by lane assignment even before the race begins. In the first year of the IBMXF World Championship in 1982 after having your standard racers to decide the World Champions in the various Classes, both Amateur and Professional, an overall World Champion was decided by racing all of the class winners including the Pro Champion and Amateur champion in a single race called the Trophy Dash. In 1982, Greg Hill, the professional World Champion refused to race the Amateur World Champion the American Nelson Chanady, claiming that there was no point to it. Nelson Chanady raced and won the Trophy Dash without Hill's participation, capturing the Overall title. However, since Mr. Hill did not race, the World Championship title lost a considerable amount of luster, since American professional racers were regarded collectively as the best in the world with Mr. Hill being among the best of them. Because of this lost of stature due to Mr. Hill not racing that final race in 1982, the Trophy Dash to determine the World Champion was abolished and in 1983 when the American professional Clint Miller won the World Professional Championship he was also considered the overall World Champion. On January 1, 1993 the IBMXF and the Fédération Internationale Amateur de Cyclisme (FIAC), the amateur governing branch of the Union Cycliste Internationale (UCI) which handled Olympic Cycling, merged formally after having held joint World Championships since July 22, 1991 in Sandness, Norway (FIAC had been holding its own separate BMX World Championships starting 1986). After a further three year transition time in which the European and World Championships where credited as "IBMXF/FIAC" the UCI held its first official BMX World Championship in 1996 in England. It has continued to hold BMX European and World Championships ever since. The Fédération Internationale Amateur de Cyclisme (FIAC) which in English stands for International Amateur Cycling Federation, which was based in Rome, Italy, was the amateur cycling arm of the UCI. It had direct ties to the International Olympic Committee (IOC). It had no professional division. That was the purview of its professional counterpart based in Luxembourg, the Fédération Internationale de Cyclisme Professionnel (FICP), also operated by the UCI. However, a class of paid amateurs called the Superclass is allowed even though it may contradict the accepted notions of what an amateur is. However, members of the Supercross class could not win more than US$200 per event and keep their amateur standing. In any case, with the allowance of professionals in the Olympics this has largely become a moot point. USA Cycling, formerly the United States Cycling Federation (USCF) as it was known at the time, was the American affiliate of FIAC. However, it did not have a BMX division at this time. The NBL worked through the then independent IBMXF. Today after purchasing the NBL USA Cycling the NBL represents BMX in the UCI through USA Cycling. FIAC started holding its own BMX World Championships in 1984. At the time the IBMXF and FIAC were two separate International sanctioning bodies that both held BMX World Championships. However, the IBMXF's was far more prestigious, professionally competently run and established than FIAC. This was because FIAC refused help from either the IBMXF and the American for profit American Bicycle Association (then as now only one non-profit BMX sanctioning body per nation is recognized by the UCI as representing BMX in a nation. In the United States's case it was and is the NBL), both far more experienced at the time in running BMX races. In some nations if you race in the IBMXF circuit (see above) you could not race in the FIAC circuit and vice versa, akin to not being allowed to race NBL if you race the ABA circuit if they had such rules in America. FIAC had odd (to Americans) conventions and rules in conducting races, most likely grafted on from road racing in which was FIAC's only experience. For instance not only did you race three times to determine average positions in the motos to advance the best four riders to the next stage in racing, something Americans were familiar if they raced NBL, you also, if the class was big enough, raced the eighths, quarters and semis also three times and the best racers qualified for the Main. Then if you did qualify for the Main, you had to race the Main five times to find the final ranking of racers. In the US only the Professionals in the 20" class raced the Main multiple times and only three times at that in either the ABA or NBL. If anything this put a premium on consistency and lowered the luck factor to a bare minimum. However, it was very time consuming even at races scheduled over two days. For a sanctioning body then new to BMX, it was pretty efficient in terms of running an event (taking into consideration the multiple qualifying runs). However, because of its inexperience it was plagued with tracks of inferior quality, both in terms of difficulty, they were deemed far too easy for venues of an international event; and the building materials used, for example during the 1988 Championships in Mol, Belgium the track was built out of white sand, which became particularly boggy in the turns. "It feels like riding on the beach"  was a refrain from many American racers. This inexperience of track construction was rectified by 1991 when the FIAC and the IBMXF started holding combined World Championship series in 1991 after four years of holding separate championship events. The two bodies formally unified in 1993 (FICP was disbanded along with the FIAC by the UCI). After a three-year transition period, The UCI held its first World Championship in 1996 after absorbing the IBMXF and abolishing FIAC. With the increasing relaxation of the rules of Professionalism in the IOC, the merged governing body, run directly by the UCI, retained the professional division. The Union Cycliste Internationale (UCI) or in English the International Cycling Union, is a Switzerland-based international sanctioning body created in 1900 which has had its own international BMX racing program since 1982 (through FIAC) and have been holding World Championships for BMX racing since 1996. The UCI also supports Mountain Bike, Track, Road Race Cycling, and Cyclo-Cross. 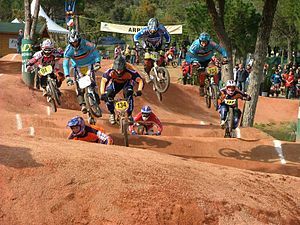 The UCI through its amateur division FIAC, held championships were separate and distinct from the International Bicycle Motocross Federation (IBMXF) World Championships until they started to hold the World Championships jointly starting in 1991 (see above). The American sanctioning body the National Bicycle League (NBL) was affiliated with the UCI via the old IBMXF which the NBL was a part of. With the merger of the IBMXF with FIAC, they in turn being folded into the UCI, and the NBL joining the USA Cycling directly, the NBL was affiliated with the UCI from 1996 to 2008. Beginning with the 2009 season, the ABA took over as the USA affiliate of UCI. Riders qualify for the annual UCI BMX World Championships through participation and qualifying in their own National Championship Race. In the US, this Championship race occurs in Desoto, TX on the Saturday of the ABA Supernationals (which are run on a Friday/Sunday schedule) in mid-March. The sanctioning bodies have slightly different rules for qualifications of advancement in races between skill levels and age classification. For instance, the ABA and the NBL used different rules of qualifying for mains from the motos. The ABA used almost an all or nothing system called the Transfer System while the NBL (similar to the UCI for international competition) used a cumulative scoring scheme called the Moto System. Below are the general rules, structure of advancement within the American Bicycle Association (and now USABMX) compared to the NBL unless otherwise noted, but the generalities are similar between the sanctioning bodies. Racers in the 20" class are grouped with others of the same relative age and experience levels; Novice, Intermediate, Expert, Veteran, "A" Pro, "AA" Pro in the ABA; Rookie, Novice, Expert, Elite Masters, "B" Pro (Superclass) and "A" Pro (Elite) in the NBL. They range from 5 & under Novice to 28 & over Expert in the ABA and from 5 & under Rookie to 35 & over Expert in the NBL. Cruiser Class (bicycles with 24" or greater diameter wheels) and the girl classes are not divided up into skill classes, only age classes in both the NBL and the ABA. The Cruiser class age brackets for example range from 9 & under to 51 & over for males, 10 & under to 41 & over for females in the ABA; and 9 & under to 55 & over males, 10 & under to 40 & over females in the NBL. In a typical day a racer will race several times with their group to determine the day's finishing order and awards. The qualifying rounds, called Motos (called heats in other types of racing) determines the number of racers in the finals which are called Mains, up to eight racers. The sizes and number of motos at a skill level and age group is determined by the number of racers who register for that race and in that skill level and age group. Usually a racer gets three chances to qualify. As stated in the previous section, the two sanctioning bodies generally use two different methods of moving racers from the qualifying rounds to the Main (although there is some overlap), the Transfer System, the method generally used by the ABA; and the Moto System, the NBL's choice. In the transfer system usually one to three people are transferred to the main depending on the size of the class. For instance, in the ABA transfer system a group of say eight racers sign up for the 17-18 Intermediate class. That is more than enough to have three motos (four is the minimum). Moto #1 will have all eight racers. The first two finishers qualify for and do not race again until the Main. Moto #2 will be a second heat for the remaining six racers; again, the first two across the finish line from that group will go the Main. Finally, a third moto of the remaining four riders is run, from which the first two racers across the finish line will be taken to the Main, forming a six-man Main. The last two racers do not qualify (DNQ) and therefore do not race in the Main, do not collect any points, trophies, a chance to take a step in advancement to a higher amateur level or if they are professionals, prize money. The NBL and the international UCI uses the "Olympic" or Moto System of advancing to the Main. In the Moto System, you must race all three times to make the main or if the race is a large one semi finals. It is a formula combining how well you do with all the registered participant riders in your class racing all three times. It cumulatively determines who will race in the finals. The higher your points total, the more likely you will advance. For instance if you come in 1st, 1st and 1st, 40+50+60, which is 150 points, you are a virtual certainty to race in the Main (or in large races you are merely transferred to the quarter/semi-finals) barring disqualification for some reason. If you come in Last, Last, First, which in a race with eight men in your class translates to 0+0+60 or 60 points, you MIGHT race in the main (or in larger races the 1/8/quarter/semi finals) determining how well the others did. The person who came in 3rd place in all three motos or 30+40+50=120p would have a much better shot at making the Main than you. Even the person who came in 2nd+6th+6th or 35+25+35=95 would have a better shot even if you won the final moto. In larger races in both the ABA and NBL, then a 2nd moto of the same class but different racers is run right behind the first group. They also race three times but instead of the winners going to the Main they face their first group counterparts (who also went through the three-moto shake out) in the semi finals called the Semi-Main. Then the qualifiers face off in the Main. The same for races large enough for quarterfinals or Quarter-Mains, 1/8s and even 1/16s. The Amateurs, once they get to the mains usually only race once for the top points and the trophy. The Professionals on the other hand run multiple cumulative Mains just like in the qualifying motos for the points, trophy and most important, prize money. This is both NBL and ABA practice. Like during the qualifying motos the points you earn in each running of the Pro Main are tied into the position you finish in each of the three motos. Cumulative scoring rewards consistency. The better the racer you are, the more consistent you will be. The transfer system lets you capitalize on the mistakes of others. The better the racer you are, the fewer the mistakes you make. One major drawback in cumulative scoring is that it is more complicated task in keeping track than in the transfer system. In the 1980s at least two national level scoring scandals (one in 1985) in which the national professional number one was decided after the Grand nationals underlined this. There was also a scoring mix up during the 1983 NBL Grand National in which it was thought Brian Patterson was the winner for two weeks but after a recount initiated after Eric Rupe protested gave Eric Rupe the number one for 1983. An even larger scoring scandal occurred in 1985 in which pro racer Peter Loncarevich apparently beat Greg Hill for the number one pro racer by a mere 3 points. Greg Hill's wife Nancy (who was the bookkeeper for Greg Hill's BMX bicycle company Greg Hill Products) kept an independent accounting of the season points of Mr. Hill's closest competitors and detected an error. At his wife's urging Mr. Hill ask for and received an audit of the points and the NBL confirmed the error had taken place and awarded Mr. Hill the pro title for 1985. The Transfer System on the other hand, was never popular with the racers. While very efficient and less error prone than the cumulative method (and allowing the ABA to run much quicker events with fewer finish line scores), the good racers generally did not like it since they would only get to race once, win their transfer moto and wait for hours if the races are big enough to race the mains (on the other hand you get to relax a little without the anxiety of doing poorly in the next two qualifying motos). This means the racers race less often in the ABA and the fun of BMX is in the racing, even if you are losing. Even racers who do not do well did not like the transfer system because the fewer actual races you are in, the less chance you will have to improve your skills in actual race conditions You also race two times less for your money paid for in entrance fees in the ABA in the Transfer system if you win your first moto. Among the Pros the Cumulative method is preferred. Not only because they get to race more, it lessens the chance of luck playing as a factor in any given race event. In 1985 Greg Hill staged a personal boycott of ABA nationals in part of his dislike of the transfer system. Cumulative scoring is not only used in the ABA and NBL pro qualifying motos but in the mains, in which the pros are required to race the mains three times to win points and prize money. Cumulative scoring, also known as Olympic scoring, is used by the UCI in their international BMX program and was used in the 2008 Summer Olympics in Beijing, China for both amateurs and professionals. The ABA continues to use the Transfer System for its amateur classes. The first ostensive goal of a BMX racer is to become the number one amateur racer in your district. The racer's home state/province maybe divided up into several Districts depending how many participants and how spread out they are over the state/province. A balance is sought. Too many people in a single district could discourage new, inexperienced riders from having a sense of accomplishment if they are doing reasonably well but not advancing his point score up the list of total points in relation to other racers. Too small a district would cheapen any sense of accomplishment due to paucity of racers, producing an artificially high ranking for the following season for the racer(s) in the points race. Points determine how well riders do in the district rankings. How high the rider goes in the rankings depends on what skill level category they are in as well as how well they do in their particular races since it affects how many points they win, which adds to their total for their district ranking. The higher the rider's skill level, the more points they can gather at any given race (providing that they qualify for the Main). In the Amateur class, advancement to a higher skill level depends on rider success in their present skill level. For instance at the ABA local level riders start out as a Novice. From Novice ten local career first places in the Mains will advance them to Intermediate Class. From Intermediate twenty local career first place wins in the Main is required to graduate to the Expert class. From there as in most other sports, it is voluntary to go professional. The Main will determine the winner that day and 1st, 2nd, 3rd, and sometimes 4th-8th trophies will be awarded. Riders are also awarded points depending on their respective finish in the race, which are added to their cumulative totals, ultimately determining district rankings at the end of the calendar year. The number of points a racer gets after a race is determined by his place in the Main. On the local level, first place Novice class will get the winner 25 points, 2nd place 20 and so on with 8th getting only 3 points. The more points a racer has the higher his ranking and thus the lower the number he gets to wear on his front number plate the following season. For instance, say in ABA New York District #1 a racer had the 10th most points out of 200 racers in his district at the finish of the 2017 season. He will then be entitled to have the number "10" on his number plate for that district during the 2018 season. The skill level class you belong to also affects how many points you get. The winners of the Expert Classes on the local level will get 100 points while the winning Intermediates will get 50 points and the winners of the Novice classes only 25 points. Second, third et al. placers would get lower points in proportion. The 7th place Expert finishers will get only 20 points, the equivalent of second place in the Novice class. In all classes and skill levels racers also receive the same number of points depending on how many are in their class and age group. These are called participant points. For instance if eight riders participate in 17-18 Intermediate class, all those who participate will get 8 points, including the last place finisher (who didn't make the main). If the class has 15 racers, all will get 15 points. So the winner of the Intermediate class will get 15 points for the fifteen racers in that class on top of the 50 points for winning for a total of 65 points. There are separate point scoring for cruiser and girl classes and separate point tables for state and national rankings. Points for those events are gathered in a similar fashion as on the district, i.e. local, level. Other important factors affect the point totals. Some local special event races are double or even triple point races, doubling or tripling the points each position in the Mains each racer would normally get. points are awarded, so an Expert winner could look forward to collecting 400 points for winning his class in addition to bonus points and participant points. To compete on a National level for national titles you must compete in Nationals. Nationals have their own separate points tables that are accumulated by the racers similarly to local district points. However the points rewarded are not the same amount. For instance 240 National points are awarded to the first place Expert winner as well as his 300 district triple points, but his national points are not added to his district points or vice versa. Like in local races he or she is also awarded participant points. The amateur with the most National points at the end of the year is the overall National number one (#1) racer and gets to wear a #1 on his number plate at national events the following season. Professionals are not affected since they have their own points system and table separate from the amateurs for the number one pro title. In the NBL there is no overall #1 amateur, only a number one title for their age group, so a racer in say 17 expert that has most points can wear a national #1 plate even if the number one rider in 12 expert actually has more points. Again, the professionals have their own points system for number one pro. There is yet another points table for State/Provincial wide events for the State/Provincial Championship. However, instead of wide gap points between winners and those who follow and between skill levels, they are quite close i.e. for first place in Expert, Intermediate and Novice it is 20, 19, and 18 respectively. Also, it is only a one-point difference between places i.e. 20 points for first and 19 points for second place in Expert. The same for the Novice and Intermediate levels. Also unlike on the National and District level no participant points are awarded. In the NBL, the points received for moto points in the cumulative "Olympic" system at the national and regional level are similar as on the district level. Nationals can also affect your skill level ranking. On the local level it takes eight career wins to transfer from Novice to Intermediate; from Intermediate to Expert 25 career wins are necessary. On the national level only five career wins are required in both cases. This is because of the much higher quality of competition found on the national level. All of the aforementioned applies with minor variations to the Girls and Cruiser Classes. A fourth class of racing in BMX which are held at local and national events are called Opens. Opens are largely exhibition and are a chance to test yourself and practice against better competition without jeopardizing your point standings. You must be registered to race in a points race to sign up for the Open events. No points are awarded for Opens although trophy places are and the moto qualification rounds are similar to the point races. These are races with more flexible skill level and age requirements. In Opens there are no Novice, Intermediate and Expert divisions. All amateur skill levels are free to participate. The age groupings are generally broader, for example 13-14 open class as opposed to 13 Intermediate and 14 Intermediate being separate groupings for those ages in the points races. Girls may also participate in the male Open class within the proper age ranges. However expert boys are not allowed in these "Mixed" opens. Then an Expert Open is held in that event. The pros are excluded from racing with the amateurs if enough pros are at hand to race that a separate Pro-Open class can be created. If not, then the pros can race in the amateur Open with some restrictions. This is called a Pro-Am event. Except for the Pro-Am exception the Expert racers usually wins the open class. Even if there are Pros in the Open, it is not unusual for an older Expert-17-18 age class for example-to win since many have the talent and speed to be a pro but have not yet taken the opportunity, partly because once you go Pro, you can go back to amateur only under very strict circumstances. There are separate Open divisions for Cruisers where similar rules apply. Sometimes an exhibition race is held after all the meaningful races are run with all the amateur class winners from Novice up to Expert and including the Open, girls classes and perhaps Cruiser classes race together once. This is called the Trophy Dash. Like in the Open Classes, no points are rewarded in this case, just a chance for bragging rights and to match yourself up against people that are at a higher skill level. Only one race for a single first-place trophy is awarded. As in the Opens the Expert usually wins with the Intermediate winner pulling one out every once in a while. Novices usually win only when a major, catastrophic pile up occurs on the track and even then the mass smash up has to happen quite close to the finish line. There are professional rankings in BMX. In the ABA the two major ones are the "A" and "AA" classifications in the 20" division. The Professionals are the only class allowed to compete for cash prizes. The first level is pro. To become an "A" pro you have to hold at least an Expert skill level rating and be at least 16 years old to be issued a Pro Membership card by USA BMX. If you are a professional BMXer with another BMX sanctioning body, you will be recognized as a Pro by USA BMX and barred from competing in ABA sanctioned amateur classes. Once you become a pro BMX racer, you cannot go back to amateur status except under stringent circumstances. What's more by turning BMX Pro you very likely be disqualifying yourself from other amateur sports depending on the state and federal laws that apply. In recent years, A Pros decide when they want to move to up to AA Pro. There used to be a $3,000 winnings cap, however, this was removed in 2015. "A" pro and "AA" pros race in separate classes generally, but if there are too few of one or the other type of pro to race separately-four is the minimum-then they race together in a combined class. This occurs generally in at large multi-point local district races but usually not at Nationals. Pro ranking points are similar to the National armateur points awards. "A" Pros get the equivalent of National Intermediate points. i.e. 120 for first, 100 points for second etc. "AA" Pro get Expert equivalent points i.e. 240 for first etc. Both like in the amateur classes get participant points if the racer makes the Main. The person with the most points in a season will be District Pro #1, the same is true to become state Pro #1. However, on the national level not only you must receive the most points, you must race in at least 10 nationals plus the Grand Nationals, the ABA's multi-day season ending event, for the best 10 of your finishes will go toward your national rankings. For example, if you participate in 13 national events, your best 10 will be considered and your worst three disregarded. You must meet this qualification on the national level to wear National numbers one though ten on your number plate the following year. The rules are similar for Pro Cruiser and Pro Girls classes. There is a fourth class of pro called Veteran Pro. These are professionals in the 20" class that are at least 30 years old and generally past their racing prime but still love to compete. Most of the rules that apply to the "A" and "AA" pros apply to the "Vet" Pros except that they are required to race in only six national events plus the Grand Nationals and are classified as "A" Pros and get "A" Pro points, However, they can win unlimited prize money as a Vet pro on this "A" Pro level without the requirement of moving up to "AA" pro upon winning US$3000 in a season. Some Vet Pros are retired "AA" pros that have come back to the sport. In those cases they had to go through a reclassification process with certain criteria having to be met, including written permission from conventional "A" Pros. "Vet" Pros cannot compete for the National #1 Championship. Many participants in BMX racing have left their mark. Most are pure racers while some promoted and sponsored races; others have created unique maneuvers and invented or helped design equipment as well have raced themselves. They have done it over the near 40-year history of the sport during distinct eras. These are just a few. Each racer is sourced on his/her individual page. *Generally speaking the "Old School" generation is from 1969, the very beginning of BMX to 1987 or 1988, during the first major slump in the popularity of BMX racing and the height of popularity of Old School Freestyling. "Mid School" is generally considered to be from 1988 to 1999, which includes the first slump in Freestyle BMX in 1988-89 and the resurgence of BMX racing beginning in 1990 and it really taking off again in 1993. "New/Current School" or today's BMX is considered to be from 2000 to the present day with the emphasis on Dirt Jumping contest and streetstyle and deemphasis on racing. With the racers, it will not be perfect demarcations. Some Old Schoolers raced well into the Mid School era of the 1990s, like Pete Loncarevich and Greg Hill. There are a few Old Schoolers still racing in the Veteran and Masters classes today, Eric Rupe to name one. Many Mid Schoolers like Warwick Stevenson and Randy Stumpfhauser are racing well into the New/Current School era. A significant number of top New Schoolers started during the "Mid school" era like Donny Robinson and Bubba Harris, so there is bleed over. As time goes by the year definitions of eras of "Mid" and "New School" will change, especially Mid School, but "Old School" will most likely always refer to the sports first 18–19 years when the pioneers began it, set the rules, promoted it, constructed the precedent setting equipment, set the records and conventions, raced it, and largely retired from it in terms of serious Senior Pro competition. CDNE=Class did not exist. TDNE=Title did not exist. Note: Dates reflect the year the racers *won* their plates, not the year they actually *raced* their No.1 plates. In other words, David Clinton won his No.1 plate in 1974 entitling him to race with #1 on his plate for the 1975 season. John George then won the No.1 plate in 1975 and raced with #1 on his plate during the 1976 racing season. *The NBA did not have a true National no.1 until 1975 when the first true national was held. Until then No.1s were strictly district. However, since the NBA Southern California District was the largest by far in the country during those years (indeed, only in Arizona did the NBA have any districts outside of California) and John George in 1975 and before him David Clinton in 1974 where the district champions at the end of those seasons that made them National No.1s by default. In the case of David Clinton in 1974 almost no tracks existed outside of California and none of those were NBA sanctioned. **The NBA did have a separate professional division beginning in 1976, but until 1979 the National No.1 plate was all around for every class pro or amateur. ***The Number One pro title did not exist until 1979. ****NBA Pros were allowed to race in the Amateur class and hold the amateur title at the time, so Greg Hill, while a professional was eligible for and won the no. 1 Amateur title. Note: Dates reflect the year the racers *won* their plates, not the year they actually *raced* their No.1 plates. In other words, Antony Sewell won his No.1 plate in 1980 entitling him to race with #1 on his plate for the 1981 season. Stu Thomsen then won the No.1 plate in 1981 and raced with #1 on his plate during the 1982 racing season. **Until the 1980 season the #1 plate holder was considered #1 overall amateur or professional. The NBL did have a pro class in 1977, 1978 & 1979 but the title of National Number One Professional was not created until the 1980 season when the pros and the 16 Experts were separated and the pros earning separate points (in the form of purse money won) from the amateurs. Prior to 1980 the pros, due to the comparatively small number of them, competed with the 16 Experts and were able to earn amateur titles. ***Title Did Not Exist The title plate for this class did exist under the title of "B" pro (which was created for the 1981 season), but it was not until 1990 when the name was changed to "Superclass" and it became a pro/am class were the racers of that class given an opportunity to win a separate year end overall National #1 plate title separate from the pure Pro and the pure amateur classes. Amateurs competed for prizes and Pros could compete for a limited amount purses. Also beginning in the 1990 season "Pro Cruiser" was renamed "Super Cruiser" and "A" Pro "All Pro". In 1996 Super Cruiser was renamed "Pro Cruiser" once again and "All" Pro reverted to "Pro Class" This was to harmonize NBL nomenclature with UCI/IBMXF labels. Because of this the NBL would change the name of its pro Classes many times during the 1990s, They even began calling there senior pro class "AA" and the junior pros "A" just like the ABA beginning in the year 2000. Continuing the name shuffle the senior male pro class was officially known as Elite Men and the junior men "A" pro until the end of the 2006 season. Beginning with the 2007 season the junior "A" pro class was called "Super X" (SX). The single level pro females are called Elite Women. Beginning with the 2006 season the NBL ceased offering an independent year end title for both the "A" pro class and the Pro Cruisers. In the case of Pro Cruiser it was an end of a long era with the Pro Cruiser No.1 title going back to 1981 when Brent Patterson first won the class. In 2007 the junior pro class was rechristened "Super X" and an independent year end number one plate was reestablished. †(AM)=Amateur. From 1981 to 1984 the girl's National No.1 title was amateur. Between 1985 and 1987 a girl's pro class was established but that division was discontinued between 1988 and 1996 due to lack of participants and those National No.1 women titles were again amateurs. From 1997 to the present the title is a professional one once again. ‡(Sup)=Superclass. Superclass was a Pro/Am class. Note: Dates reflect the year the racers *won* their plates, not the year they actually *raced* their No.1 plates. In other words, Stu Thomsen won his No.1 title in 1979 entitling him to race with #1 on his plate for the 1980 season. Brent Patterson then won the No.1 plate in 1980 and raced with #1 on his plate during the 1981 racing season. *Until the 1979 season the #1 plate holder was considered #1 overall amateur or professional. The ABA did have a pro class in 1977 & 1978 but the title of National Number One Professional was not created until the 1979 season when the pros and the 16 Experts were separated and the pros earning separate points (in the form of purse money won) from the amateurs. Prior to 1979 the pros, due to the comparatively small number of them, competed with the 16 Experts and were able to earn amateur titles. **Title Did Not Exist. While the ABA did start its pro cruiser class in 1981 the title pro cruiser National Number One did not exist until 1987. ^ "A short history of BMX Racing". uci.ch. Union Cycliste Internationale. 6 Jul 2017. Retrieved 11 Jun 2018. Bicycle Motocross (BMX) originally started when children began imitating motocross riders on their bicycles. ^ a b "Gerrit Does's "University of BMX", History of BMX 1978 till 1979". Universityofbmx.com. Archived from the original on 2013-11-10. Retrieved 2012-08-08. ^ "Gerrit Does's "University of BMX", History of BMX 1981". Universityofbmx.com. Archived from the original on 2013-11-10. Retrieved 2012-08-08. ^ "Google translation of the VBC webpage". Translate.google.com. Retrieved 2012-08-08. ^ a b c d e Gilli, Germinal (1986). Bmx. Sport e avventura (in Italian). Edizioni Mediterranee. ISBN 88-272-0410-5. ^ "Gerrit Does's "University of BMX", History of BMX 1983". Archived from the original on 2011-08-14. Retrieved 2009-02-28. ^ "Gerrit Does's "University of BMX", History of BMX 1984". Archived from the original on 2013-11-10. Retrieved 2009-02-28. ^ a b "Gerrit Does's "University of BMX", History of BMX 1985". Archived from the original on 2011-07-02. Retrieved 2009-02-28. ^ "BMX page on the FCI official website" (in Italian). Archived from the original on 17 November 2008. Retrieved 15 October 2008. ^ "Gerrit Does's University of BMX 1986 and 1987". Navada.net. Retrieved 2012-08-08. ^ a b "Gerrit Does's "University of BMX", History of BMX 1980". Universityofbmx.com. Archived from the original on 2013-11-10. Retrieved 2012-08-08.